In the first lab I made my first felt. This is not the first fabric I’ve made. My grandmother taught me to knit a sweater when I was small. I ended up spending many hours and only had about 1/100 of the sweater presentable. This experience gave me a general impression about making fabric, which is hard. The fabrics were done, now we need to attach the electronic to it. And an essential step here is to do conductive felt. The conductive fibers are surprisingly soft and smooth. We felt it onto the wool without any difficulties, but the problems came when we tried to put two pieces together with a LED in between. First, the safety issue is important, as the wool will catch fire if it doesn’t play fairly with electricity, based on this, the connection needs special care. We need to examine it with special device before really connecting them together. From another perspective, on one hand you need it to be in the right direction when you put two pieces together, where we done it wrongly but it was easy to fix, on the other hand, as both material are soft and the conductivity of steel fibers depends on its density, which is sensitive to our touch and pressure. We spent some time debugging and it finally worked! I really learned a lot as well as had great fun in this lab. I’m really looking forward to the next class. (http://en.wikipedia.org/wiki/Textile). We can see that there are something unchanged: fabric and textiles are something being made by people and some of them are woven, yet beside this, people nowadays have known that the basic unit of fabrics is fiber, both natural and artificial, and there emerges all other various ways to make fabric besides weaving, which correspond with the fast industrialization and science development nowadays. Then if I trace this line in the opposite direction, based their modern images, I may outline the first fabric and textiles: it was made from natural material of easy access and it was woven in a simple way. There are many scientific data showing the ancient use of fabrics and related tools that dated back to even prehistorical period. However, the question of “the first” is always hard to find a certain answers. There is statement that “the first actual textile, as opposed to skins sewn together, was probably felt” (http://en.wikipedia.org/wiki/History_of_clothing_and_textiles), which for me is quite reasonable. During prehistoric period, or even before the prehistoric time, there were probably no tools for common way of weaving by threads or spindles. People might just roll and push suitable fibers together that they obtained in their daily life, expecting that they form a thinker material. And under some heat and moisture they did. And there was felt, the first fabric potentially. (Also very interestingly, the first fabrics I’ve ever made is also felt haha). Then comes the question of why they wanted a thinker material and thus tried to put single layer of fibers to multiple ones. “Anthropologists believe that animal skins and vegetation were adapted into coverings as protection from cold, heat and rain, especially as humans migrated to new climates” (http://en.wikipedia.org/wiki/History_of_clothing_and_textiles). At that ancient time, the most important and fundamental thing in people’s life and mind was most likely to be survival. And fabric then might be one of the tools people developed to survive the tough situations like weather and climate issues, out of the very basic nature of every living things to embrace life and shun death. As the evolution of human race to be more and more advance, with the emergence of civilization, fabric and textiles started to take on new use and meanings, such as ornament or ceremony, etc. For me, fabric in my life mainly consists of clothes, towels, curtains and things on the bed, which has both functional and aesthetical aspect. It is hard to say the location of my fabric on the Nature/Nurture/Form/Function graph, because with the fast development, fabric is expanding itself to cover with as large as it could on the graph with one single piece, embracing both function and form, and reconciling nature and civilization. I have never done felting before and have never even seen how is it done, so it was really cool not only to see the whole process but also be a part of it. In the class we learned different felting methods. 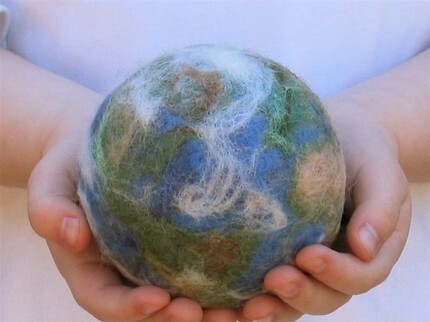 Basically, wool can be transformed into felt using the techniques of needle felting and wet felting. In this lab we used the first one, because second one is too mafan and messy, but I looked up the pictures of wet felting and it looks so pretty, so I definitely want to try this method at least once. But needle felting is also really fun! We were divided into two groups, because they were not enough needles for everyone. Each group got a wool, needle and a board. All we have to do was to place some wool on board and use needle to press it. 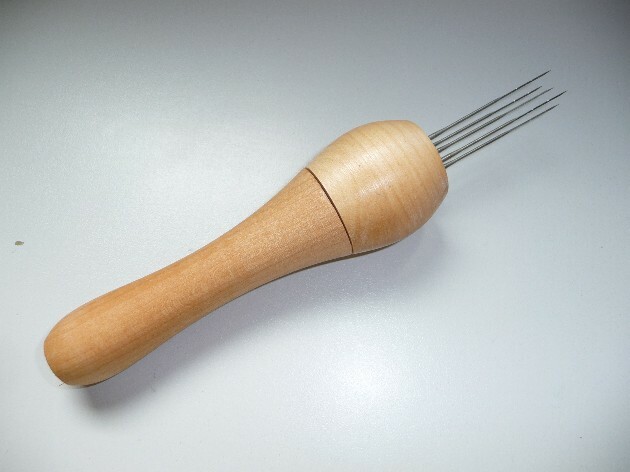 We had two different kind of needles, and felting felt different depending on the needle we used, but I think it would be easier to have a needle like the one on the picture. We also had to flip felt few times, so it will get a better density. When the base looked almost done we applied small amount of conductive fibers and felt them in with the felting needle. We tried to be creative, so one group came up with idea of heart and our group came up with a smiling face. After this I checked the resistance values using a multimeter and it worked fine. In the end, we felt two pieces of fabric together and decided to put LED on the nose of the smiling face, and tried to test it with a 3 volt cone cell battery, but it did not work. After some changes, the smile was finally done and the nose did light up! I don’t have pictures of it so I just stole Alicja’s pictures (shhhh) . Nowadays, fabric is an integral part of human existence. For some people it is a only a tool to protect their body from weather conditions and external looks, for some, it is a way of expressing their own mind, for others it is even the art, the meaning of life and worship, for others it is a fabulous way to earn money. It seems that in every era, in every country, in every nation fabric played an important role. However may be not in every era, when did it actually came to existense? There are a lot of guesses and theories about this topic. 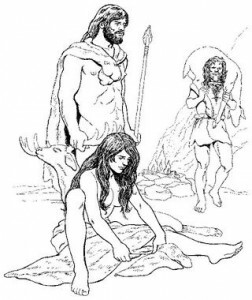 According to the biblical beliefs, the first people on earth , Adam and Eva, lived in a beautiful paradise and enjoyed the exuberance of nature and did not feel any discomfort and shame about their nakedness. But one day, Eva met the serpent-tempter, who suggested her to try the fruit of the forbidden tree and blew them, they did so and begun to feel ashamed about their naked body. Adam and Eve tight after it became embarrassed and began to pluck the large leaves from the trees, which could cover up the interesting parts of their bodies. When God looked at the Adam and Eve he saw their covered body and realized that they disobeyed him. He drove them out of Paradise. Since then, people on this earth wear clothes to cover their shame and protect themselves from the various phenomena of nature, which God “rewarded” people for disobedience. 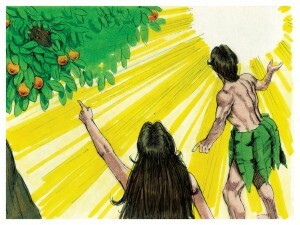 (http://biblehub.com/genesis/3-7.htm) This means according to Bible, first fabric was made of large leaves. However, I’m not religious, so I believe in Darwin more than I believe in Bible . I think fabric came to existence as soon as man put off monkey skin, so for him it was a purely practical question related to the protection of his body from cold. Scientists found stone scrapers and bone needles from the late Paleolithic times (http://history-world.org/stone_age1.htm) , which were used for handling and stitching skins. Material for clothes, except the animal skins were leaves (the same as in the bible theory), grass, bark . Primitive people did not feel shame of being naked. When it became possible to sew skins, people created the costumes according to their aesthetic sense, it was a way to express their attitude to the environment and themselves. Fabric was symbolic and replaced tattoos they used before. This was my first time felt-making and I was pretty excited to give it a try. In previous classes, we talked about different ways to create felt, including the method we used today, but I was still very surprised to see the actual process. Our goal today was to make felt and incorporate a circuit, consisting of a battery, conductive fibers and an LED, in the felt. In order to achieve that, we needed first two pieces of felt. We started by placing threads of wool on a special sponge-like board. Half of us were working on the red piece of felt, while the rest focused on the white piece. Once the threads were neatly aligned on the board, we started stabbing the wool with needles. The corners came first, then the middle. Soon, our threads of wool stuck together tightly enough that we could lift the felt off the board, try to condense it, and then stab again. At this point, the felt was rigid enough that we could start incorporating the stainless steel thread into it to create the circuit. Before that, we had to decide where we wanted to place the LED, and we chose to make it look like the nose of the smiley face. Then, the conductive threads were aligned on both sides of the felt and stabbing began again. I really enjoyed my first fabric-making experience and I am looking forward to exploring other ways to produce materials as the course advances. This science fiction’s main idea is focusing on that people’s excessively depending on machine in the future leads to the end of human civilization. Vashti, the mom, is one of the most typical examples of people who are crazy about machine–staying at her cell house “where buttons and switches everywhere–buttons to call for food for music, for clothing”(4) underground all the time, having no interest in traveling even visiting her son Kuno. However, Kuno is an opposite example–a rebel who wants to visit the surface which is not permitted. Human beings created machine. Machine obeys human’s order. But in that world, people worshiped machine as a god. On the air-ship, all the passengers were shouting “How we have advanced, thanks to the Machine!”(8) They completely forgot it is human who creates those machine. It seems that Kuno is the only person who is clear about machine. He said “we created the Machine, to do our will, but we cannot make it do our will now. It was robbed us of the sense of space and of the sense of touch, it has blurred every human relation and narrowed down love to a carnal act”(13). Without machine, human has no longer any ability to survive. So the genocide of human is undisputed. Compared to other movies like I, Robot, AI, this novel gives us a deeper cautionary that in no way will human beings get advantages if we over depend on machine. The Machine Stops: But this blog post is just starting! I am not sure what part of the story I want to talk about first, nor do I think I can manage to cover all I would like to in a simple response. What I would most like to say is, wow, that sure is relevant for something written in 1909. First, it reminded me quite a bit of H.G Well’s Time Machine. In the Time Machine, he underground apparatus of the Moorlocks, equipped with air vents is very reminiscent of the physical nature of “The Machine.” Not to mention, there is a continuous man v. nature conflict consistent throughout both novels. Man’s apparent triumph over nature, causes man to become lazy, ultimately leading in the re-triumph of nature, and man’s demise. The Machine has “conquered Leviathan,” which is an allusion to Thomas Hobbes’ book demonstrating the brutality of living within a state of nature. The totalitarian government Hobbes’ calls for is provided by the Machine. In this novel, the corporate empire called “The Circle” creates and manages immense amounts of social media tools. The speaking tubes in The Machine Stops remind me of Mae, from The Circle. She has a job to answer continuous questions via headset, just as Vashti was asked her opinion on the food. Both have the ability to be constantly flooded with conversation and questions; yet, they can turn off these features when they need to focus on one thing. It is stressful just to imagine having so much on your mind at one time. I would also like to point out the current relevance this piece plays in our school. As we transfer from a material to e-books, we can say we are departing the “Age of Litter,” mentioned in The Machine Stops. One thing I would like to say about books is that when the machine did stop, it is interesting that they found comfort in the physical and material book. I think the materiality of the book stands for something quite important in this story. The documentary, Transcendent Man, follows the life of the technologist Ray Kurzweil, and it is interesting in relation to The Machine Stops. The idea of the “cyborg” or the half-human, half machine is prevalent in both pieces. But, what Kurzweil doesn’t cover is the essential question of the piece we read today. What happens if the machine stops? Can we put so much trust into a piece of machinery? standards, within the world of the story she is also practical, educated and a caring mother. of the story, I’d likely be more hesitant, more complacent, and more like Vashti. works. The way people passively accept the Machine’s wills can be compared to a lot of things. accept it immediately without even knowing (myself included). a manmade creation that rose above. an accompanying movie adaptation, with someone like Chris Pine as Kuno. While reading the text, I’ve been left confused and puzzled numerous times trying to understand what Vashti and Kuno were (humans or machines or parts of a bigger whole machinery) and how things operated in the underground world that they seem to inhabit controlled by “The Machine”. I know for one that technology is of great importance to them and that it is really advanced. Everything is instant and available without having to move places. The story is like a depiction of a human world but this time it is under the surface of the earth. At first, I thought that Vashti could behave like a charge or a signal or message that travels the wires of a machine. Like in a circuit, a bus of charges travels and at each intersection a charge leaves the bus and travels its respective path job. But as I continued reading, I got the impression that they were some sort of humans or robots that were confined and isolated under the earth and it made me wonder what they were doing under the earth? It felt like the conditions above the surface of the soil had gotten really rough and they could not go up for that reason because they would die up there. The Machine governing, controlling and dictating all their actions tells me that they have no free will of their own. Anything that is ‘unmechanical’ is punished. This lack of freedom kind of made me sad, but at the same time reminded me of robots and the wirings in a robot, every part has a specific role to perform and obviously cannot do anything else than that specific job. This also made me think of cells in the human body or anything living being, in the sense of cancerous cells, for example when a cell stops performing its job but does something else like attacking others of its own kind and so on. This is like contamination and bad cells that have to be eliminated or removed in order to restore peace in the body. In this way, anything that is not mechanical needs to be eliminated. I also found the juxtaposition between the need to generate and to think about new ideas for those humans against following everything the machine dictates quite funny because of the tension with the idea of freedom. Another thing that had my attention was that this story made me think of people who are completely anti-social and always confined to technology. I thought that one cannot separate himself from the outside world completely for that long because it only does harm to one. I feel like the author is against this ‘isolation’ and confinement from everything and everyone else in the text. This is life, you have to get out and enjoy it because you only live once. There exists a natural beginning and end to everything. I would think The Machine Stops as a great prediction of the 21st century life, which is written by E. M. Forster more than 100 years ago. The three main characters in this fiction, Vashti, Kuno, and of course, the Machine, can be viewed as the three analogies of the people who are obsessed with Internet and high-tech, the people who are trying to lean back toward the old-fashion, or to say, the humane way of living, and the Internet and high-tech itself. The fiction proceeded with the conflicts between the three main characters. The most noticeable conflict is the conflict between Vashti and Kuno, the mother and the son. The conflict seems to be the disagreement of paying Kuno an actual visit by Vashti, but what I see is the two different type of idea trying to fight each other. In the conversation described in the 1st part of the story, I can tell that Vashti worships the Machine so much while Kuno is just the opposite. As Kuno says, “[m]en made it, do not forget that. Great men, but men. The Machine is much, but it is not everything. I see something like you in this plate, but I do not see you. I hear something like you through this telephone, but I do not hear you. That is why I want you to come. Pay me a visit, so that we can meet face to face, and talk about the hops that are in my mind. (Forster 2)” Isn’t that just the case we are encountering every day in life? We seem to keep in touch with our family and friends every day, but do we actually see them? What we see are just the images formed by our computers and smartphones. The more we use the Internet and high-tech to keep in touch, the more we are losing our dearest people. Also, relying on the Internet and high-tech to communicate strongly lead to the society alienation. And this alienation can sabotage the basis of human society. We become so obsessed with our smartphone, and we rarely realize that they have become our masters, ruling our daily life. In this short fiction, there are also other conflicts: the conflict between Kuno and the Machine, which Kuno tries to escape but being captured and threatened with Homelessness (death); the conflict between Vashti and the Machine, which is described in the last part of this fiction when the Machine stops and people including Vashti are in extreme horror. There are a lot of things can be written about this short fiction, but there is one thing that I want to point out in addition to its prediction of the 21st century, which is the consent of humans living in the underground world. For example, they take the humming of the Machine as silence because they have never lived a life without the humming of the Machine. However, after the Machine stops, people are uncomfortable with the silence because they have never lived a day without the Machine. So the silence of the humming Machine is one example of the consent of people, which they just take everything for granted and never ask. And there is another example, which is that after the Machine stops, there are problems with the music, but Vashti and her friend soon get used to the broken music and taken it for granted. That is consent, the unquestionable consent to the Machine. E. M. Forster wrote the end of humans of the post-apocalyptic underground world as dying with the Machine, but he also wrote in the voice of Kuno, Vashti’s son, that humans who lived above the ground would learn the lesson and continue to strive.He hides his concern about the relationship between humans and the Machine in this short fiction, and the world he described 100 years ago now has become part or most part of the reality. We are under the impact of the Machine, and somehow the Machine’s slave, because some people cannot bear the life without the Internet and high-tech. The technology should be helping people’s life, not ruining it. It is leave to us to find out the relationship between humans and the Machine, the relationship between humans, and the importance of actual relationship and communication between people. Only when the Machine stops can humanity find out the important things in their life.